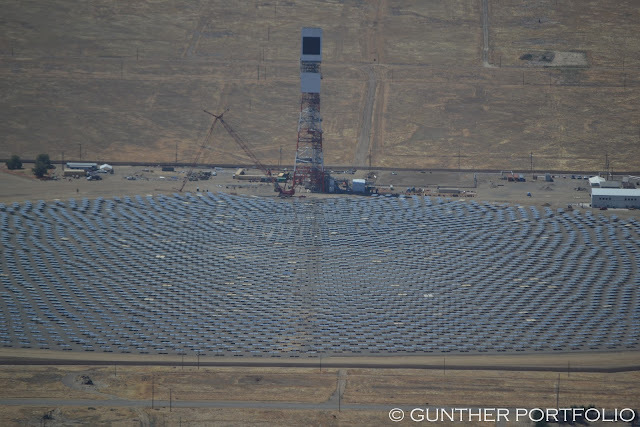 Exclusive Aerial Photos of the 29 MWth (MegaWatt thermal) Solar-to-Steam EOR (Enhanced Oil Recovery) Project. Ready for on sun trials soon? I started thinking about aerial solar surveys when my In Search of BrightSource Energy’s Ivanpah Solar Project post was obsoleted by the “Aerial Views of Construction Progress” over at Basin & Range Watch. As I recall, I must have mapped the location of Coalinga wondering if the project was already being tested on sun. When I looked for photos, any photos of the site, all I found were two photos by Visual Artist Frank Bonilla on flickr circa January 28, 2011: 6 Men In Basket, 325 Feet Up In Air and Solar Boiler Tank. 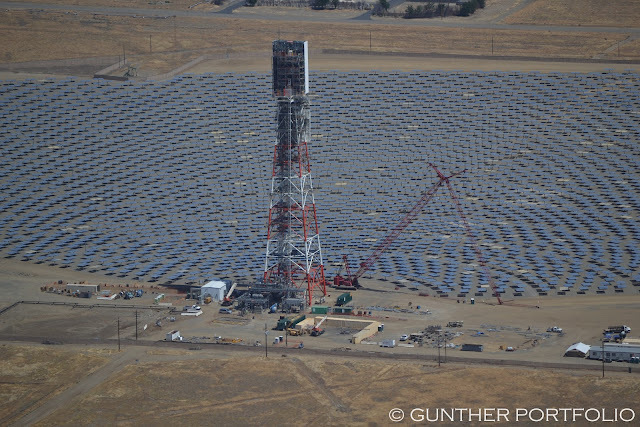 With the Coalinga Solar-to-Steam for EOR project “scheduled to begin operations in the second half of 2011”, I could almost smell the CSP in the air. Seeing the fence in the Solar Boiler Tank photo, the idea of an aerial reconnaissance mission (ah, survey) was hatched. I have two friends who are pilots, and one had just complained to me how everyone just wants fly to see San Francisco and the Golden Gate. I had an offbeat destination in mind. As it turned out, both pilots were interested in flying to Coalinga. Scheduled later the same week, the first flight attempt was scrubbed because of airport fog and windy conditions. A week later, all systems were go for a morning departure. En route to Coalinga in our Cessna 172N aircraft, I tested my camera skills using everything I had learned reading “Aerial Photography or How to Photograph from Aircraft” by Ken Rockwell the night before. 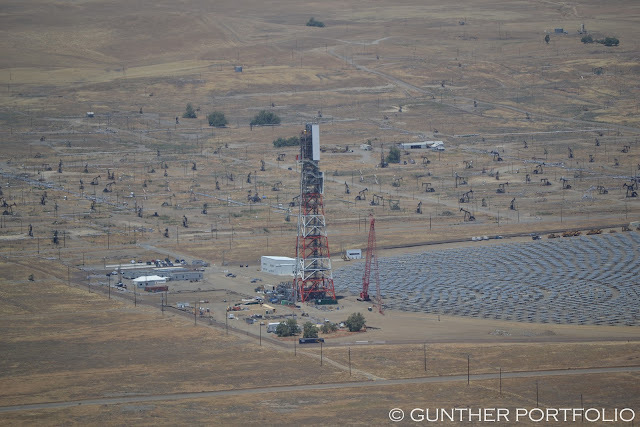 Tucked in the southwest corner of Fresno County, the Chevron Corporation (NYSE:CVX) Solar To Steam Project 19C tower was immediately visible as we flew over the last mountain of the Diablo Range north of Coalinga. 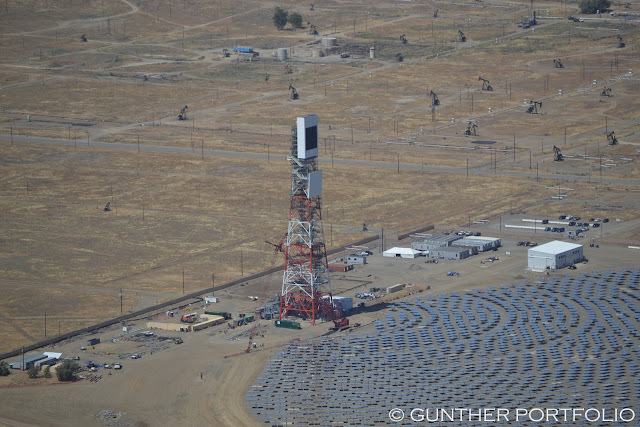 Approaching the solar tower, I opened the right window upon pilot approval and began snapping away in continuous shutter release mode while keeping a firm grip on the camera. With my head leaning out the window for an extended period, I felt as though I had breathed through my nose by mistake underwater. 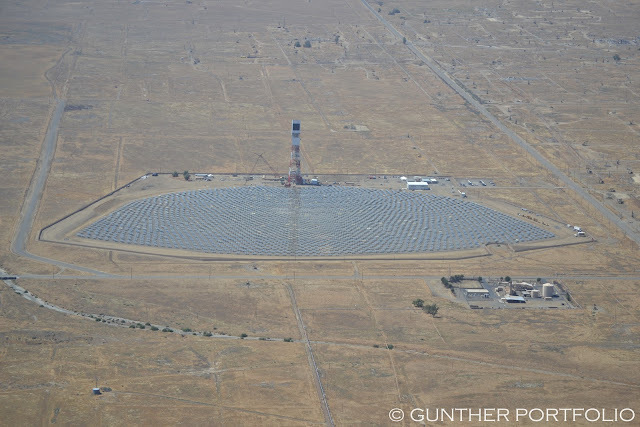 My pilot, who has requested anonymity, slowed the plane as we circled the solar tower once before landing at the New Coalinga Municipal Airport. As shown in the interleaved photos, the heliostat field appears complete although no determination can be made about operability. 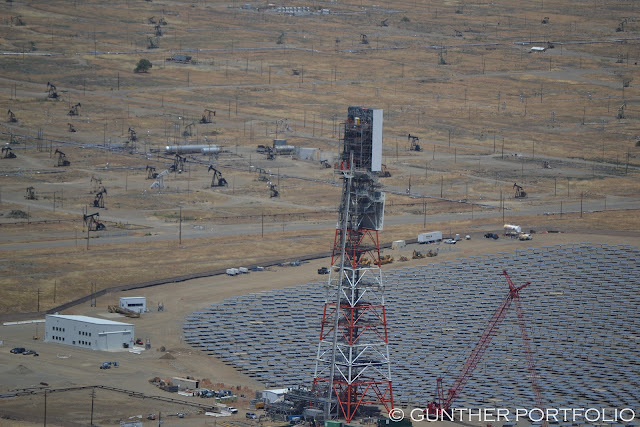 I observed work towards the top of the solar tower was still being done. The solar tower was not in operation during the flyover. 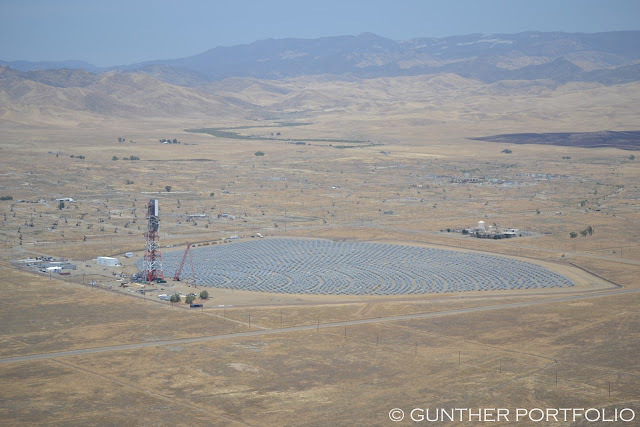 The Chevron solar-to-steam project is managed through Chevron Technology Ventures. The project is under construction and scheduled to come on line this year, 2011. We were not required to file permits with CEC nor Fresno County. The project is located on property already owned by Chevron. Of course, the last response was fast proven wrong when the Fresno County Planning and Land Use Department confirmed having permits and applications on file for the Coalinga site. The Chevron spokesperson never responded when I challenged the erroneous permit statement. 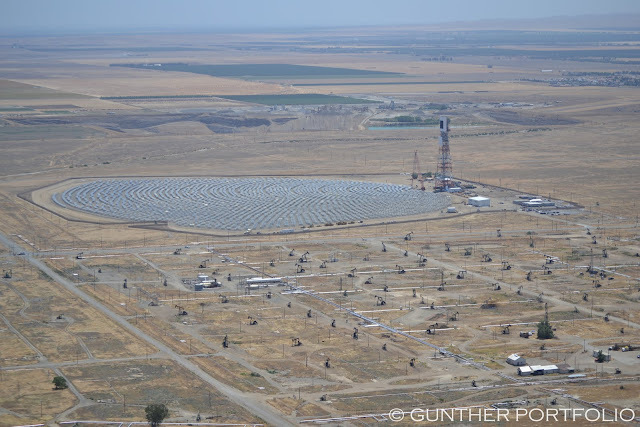 Even if there were an oil field exemption, the 323 foot (98.5 meter) solar tower would require some form of permitting. BrightSource, which filed with U.S. securities regulators for an initial public offering in April [ID:nN25219102], said in an amended filing on Thursday that it had set aside $40.2 million to account for losses since the project’s inception, $29.7 million more than it originally anticipated. In the filing, Oakland, California-based BrightSource blamed the cost overruns on design and engineering changes, weather-related delays and efforts to speed up completion of the project. Under the terms of the contract, those costs could not be passed on to Chevron, BrightSource said. Here is the BrightSource Energy, Inc. AMENDMENT NO. 2 TO FORM S-1. On January 22, 2010, the “BrightSource Energy & Ivanpah Project Overview for the Renewable Energy Policy Group” presentation indicated on the “Project Scale – Up” slide the Solar Thermal Chevron EOR Demo Plant (29 MWth) would be completed by 4Q/2010. Project completion is running almost a year later than expected thus far. Yes, there is an early site preparation photo in here as well. This will be BrightSource’s largest engineering, procurement and construction project to date, allowing BrightSource to explore nontraditional applications of solar technology for the oil and gas industry. I shot around 700 photos during the flight. I chose the top ten (10) for inclusion in the post, and my best thirty-two (32) are in the Picasa slideshow below. In addition, the headline photo was retouched using the stock Enhance button in iPhoto. The colors may be enhanced but they are not natural. Visibility was good on the day of the flight but haze was apparent on the horizon. 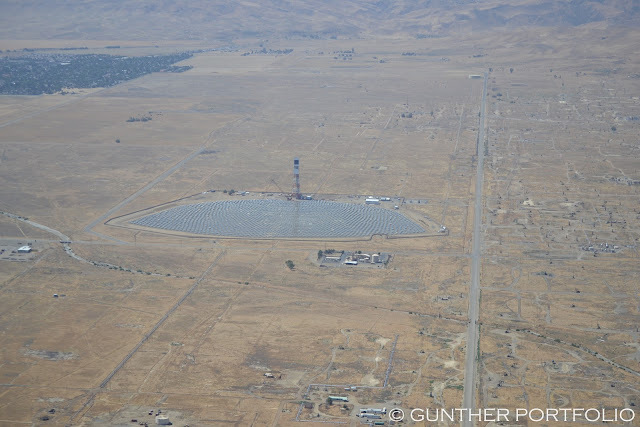 However, it was clear Chevron did a better job selecting disturbed land for Solar To Steam Project 19C than BrightSource did siting the Ivanpah Solar Electric Generating System (ISEGS) Project. I’m confused how the BrightSource project showcase website (http://ivanpahsolar.com) mentions the “BLM Approves Next Phase of Construction at Ivanpah Solar Electric Generating System” without ever acknowledging the US Department of the Interior (DOI), Bureau of Land Management (BLM), California Desert District issued a Temporary Suspension of Activities, 4/15/11, for the ISEGS (CACA-48668). Selective disclosure? I left indecipherable clues on twitter about my Coalinga activities here and here. Great images, mission accomplished! That is quite a tower. What is the full cost per kw installed? Ed, With access to a Cessna, you could generate a portfolio of solar project “centerfolds” flying around California. Awesome post. Great photos! My husband works there and it is great to get a better look at it. This is the cost so far; the project has not been completed yet. Remember Ivanpah has only “$66.5 million of overrun contingency reserves” for a project exactly 29 times larger with turbines. Stephen, I am going to need a huge tip jar to finance flights across California photographing all the solar installations. It would be fun. I was on the project and left this past January when they still had rows 1-3 of HR’s to install. Kinda cool to see the HR’s all the way up to the tower. I was able to take a ride in the basket on the triple 9 crane at the end of last year. The view was amazing. Coming home from a meeting with Brightsource in their corporate office, I was able to snap a few shots of the site, but nothing like these pictures. or in other words it takes 3 MWth to make 1 MWe. 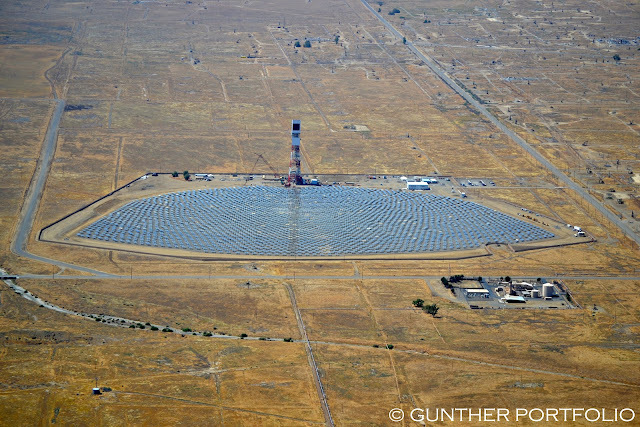 Ivanpah (current phase) = 300 MWe or 900 MWth which is 900/30 or 30 times larger than Coalinga. Coalinga 8,000 mirrors, Ivanpah ~ 240,000 mirrors. 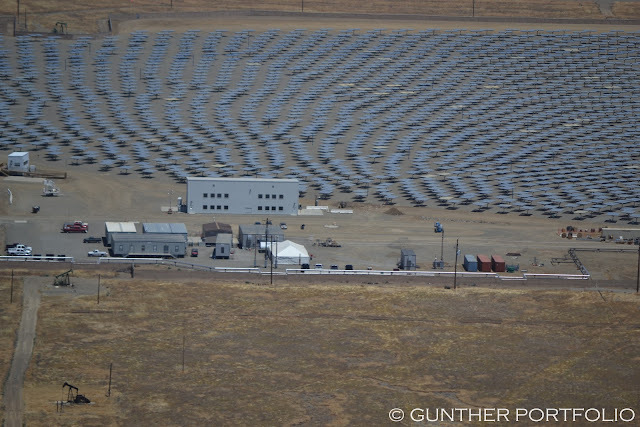 Mirror field is approx 1/2 capital cost of these CSP systems. Nice to see you are still doing your thing. I like your style I really do. Keep it up.